EAW038520 ENGLAND (1951). 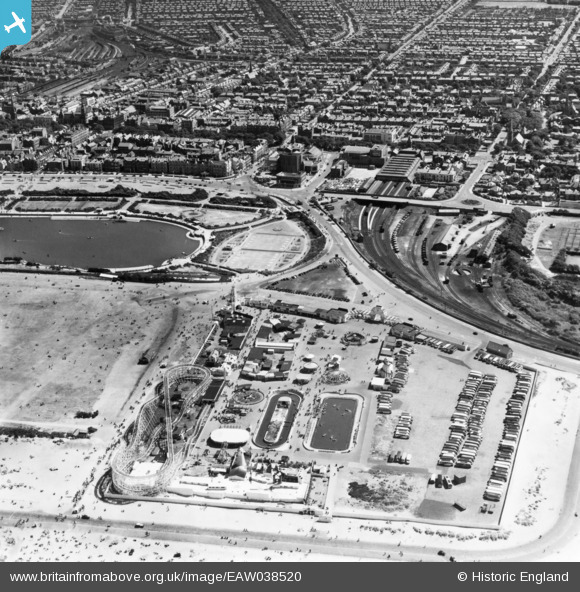 Pleasureland and the surrounding area, Southport, 1951. This image has been produced from a print. Title [EAW038520] Pleasureland and the surrounding area, Southport, 1951. This image has been produced from a print. Southern "Pleasureland" terminus of the lakeside Miniature Railway. Old signal box, built by the Railway Signal Company of Fazakerley, opened 1884 and closed 1949, the building was retained for some unknown purpose after closure and was still standing in a derelict condition in 1955. The new signal box was an LMS design and opened in 1949. It closed in July/August 1952 and was moved to Ribble Sidings at Preston. It reopened in may 1953 and remained in use until 1973. New signal box to LMS design opened in 1949 and closed July/August 1952. It was transferred to Ribble Sidings at Preston where it reopened in May 1953 and closed in 1973. Many of the new 1949 signals at Lord Street were also transferred to Ribble Sidings in 1953.